The Vibe TC is the latest pedal board friendly evolution from our famous Voodoo Vibe which is used by so many great guitarists such as Page ,Clapton and Gilmour and remains the benchmark industry standard for this type of pedal. The TC version has the same chorus sound and circuit of the bigger Vibe with the added easy performance foot controls of SPEED and INTENSITY all housed in a smaller size enclosure to caters for today's modern players needs. There are also 2 smaller soft touch controls for SWEEP and LEVEL This new format is very simple to use and has been designed to produce great sounds instantly with no fuss straight from the box. The 2 large knobs make accurate adjustment of SPEED and INTENSITY very fast and player friendly. The Vibe TC is completely analogue is operation and uses discrete Class A audio circuitry for that professional studio quality that the Vibe series is famous for. This extremely transparent and full sound quality is immediately apparent when listening to it as there is no graininess or digital artefacts. The TC is triple shielded using a multilayer pc card with power and ground copper planes to provide ultimate low noise operation. Extensive internal power supply filtering is used to produce virtual battery operation for all audio and a separate internal voltage regulator ensures that the modulation circuits operational parameters do not change when using different power supply voltages. The TC can be operated with a wide range of power supply voltages from 9-18 volts. A USA CARLING footswitch is used to provide a TRUE BYPASS or HARD WIRE BYPASS signal path and the OUTPUT is LOW IMPEDANCE from a transparent buffer driver. 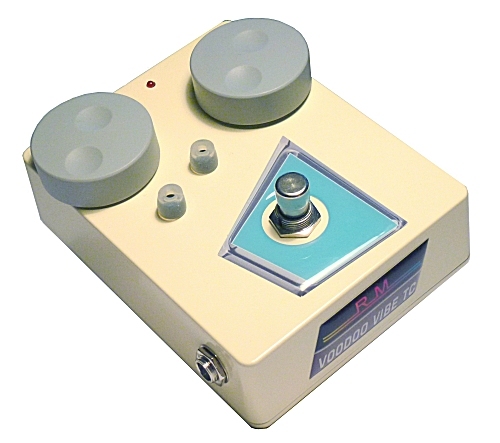 This makes the unit extremely flexible for pedal boards and in recording studio setups. INTENSITY CONTROL performance control with large knob for accurate and easy setting from ZERO to MAXIMUM MODULATION. ERGONOMIC DESIGN: The layout is normal industry standard with INPUT on RIGHT and POWER from the TOP VIEW.